Music is the language to the soul, and there is some new great music coming out to soothe, make merry, and warm our souls this chilly fall! Even though it's hard to say good-by to summer, some of the albums I'm hearing about have me pretty excited and will certainly make it easier to slip out of the shorts and tank tops, into the jeans and sweaters, and a better frame of mind. I've had a crush on Paul McCartney since I was old enough to crush. Some things just never change and that makes me so so happy! You know what else makes me happy? 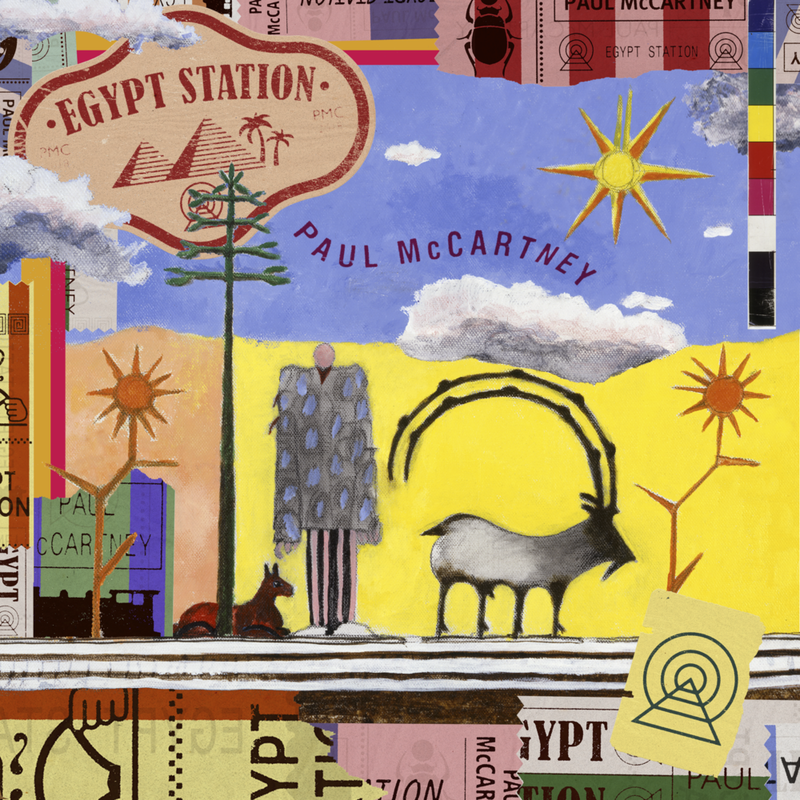 Sir Paul will release an all new album, Egypt Station, (the first full album of all-new McCartney music since 2013,) this September 7. True to the inspiration behind its title, Egypt Station’s 14 songs combine to convey a unique travelogue vibe. Between the opening and closing instrumentals “Station I” and “Station II,” each song finds Paul capturing a place or moment before transporting the listener seamlessly to the next destination. Stops along the way include an acoustic meditation on present day contentedness (“Happy With You”), a timeless anthem that would fit on virtually any album of any McCartney era (“People Want Peace”), and an epic multi-movement closer clocking in at seven minutes with a song suite structure harkening back to the days of Paul’s previous combos (“Despite Repeated Warnings”). The result is a kaleidoscopic journey through myriad musical locales and eras, yet firmly rooted in the here and now--with Paul’s singular unmistakable melodic and lyrical sensibility serving as a guide. I'm climbing aboard at Egypt Station and think you too should get your ticket to ride! My good friend, Rod Stewart, will release his 30th studio album, Blood Red Roses, September 28th on Republic Records! I can't be more excited! “Blood Red Roses,” is a deeply personal 13-track collection of originals and three covers, and has been described as "...quite simply peak Rod Stewart." It moves as smooth as the man himself, from acoustic driven folk, through Motown-tinged pop/R&B, to unadulterated rock’n’roll, with those quintessential Rod Stewart heart-melting ballads thrown in. There is no one NO ONE quite like Rod Stewart, a legend who has enjoyed chart-topping hits every decade of his career. I'm absolutely thrilled that this album is being released and looking forward to watching many of the singles become more ageless tunes we'll be rockin' to for the next 50 years! Rod has donated several concert packages that have helped support Point Hope, and I couldn't love him more for it! Pre-Order Blood Red Roses HERE now. And, for more information, visit RodStewart.com. Call Me Sir - out NOW! Train will be coming out with their Greatest Hits album on November 11th along with a few new songs, including the sweet “Call Me Sir,” that features Cam and Travie McCoy which is already being played! Last January, Train released their 8th studio album, a girl a bottle a boat, and the lead single, “Play That Song,” went platinum in 4 countries!!! They are a multi-talented, multi-faceted group that gets a LOT of air-time on the Delilah program, and one I especially love to play during the holidays. Christmas in Tahoe, re-released last year, brings that signature Train sound to holiday classics as well as several original songs. It's so so good! Train recently wrapped up a spectacular co-headline tour with Daryl Hall & John Oates. I hope you were able to catch it in your area! If not, check their tour page for upcoming dates. Hopefully they'll be scheduling more venues soon! AND, did you know Train partakes in other ventures outside of music? Proceeds from newly launched Save Me, San Fransisco Chocolates, and Drops of Jupiter® wine portfolio go toward Family House, a San Francisco charity that supports families of children with cancer and other life-threatening illnesses. "Helping and relating to children has always been a priority for us (Train). We were kids ourselves when we started Train, and played in coffee shops in and around San Francisco - and now we all have children of our own. Because of that, our San Francisco roots, and the fact that some of us have experienced our children being in NICIU's, the best way for us to give back is with the Family House Organization." Train has also been a very generous contributor to my own heart's cause, Point Hope. I love the music, I love frontman, Pat Monahan, and I love their hearts! Climb aboard the music, and experience, that is Train!